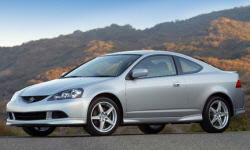 Why the 2006 Acura RSX? Clean lines, classic Acura. The 05/06 model refresh did away with the cutouts on the headlights and taillights. I think this makes the exterior cleaner and more modern. Excellent 2.0 liter. Sky high 8100 redline! 6 speed manual transmission. The motor loves to rev, it's a blast to drive at redline. Excellent handling with a slight hint of understeer if pushing hard with the motor. Very nimble and perfectly weighted steering feel. I just know how this car is going to react when tossed around, very predictable. Interior is top notch, high quality materials surrounds you. This is what small cars today are trying to accomplish, and Acura had it back in 02! The seats are something of beauty, and hold you as good they look. Deep bolsters and good ventilated leather. I did have a problem with the 2ed and 3rd gear grinding while shifting. Acura serviced under warranty and completely resolved the problem. Why Not the 2006 Acura RSX? Insurance is high for a car in this class. Mostly has to do with they type of people that purchase them. I think one report had this car as the second most deadly car, and it was not because it lacked safety features, it's who's driving it! The rear seat is not much use if the front passengers are over 6ft. Very little head/leg room. But you don't buy this type of car to haul 4 people around. But in a pinch I've had 4 in there, and I'm 6'4". It rides like a sports car, you feel most of the irregularities in the road. This is great to help the driver gauge how hard to push the car, but can become tiresome for the daily grind.